The Powder River Basin (PRB) is a region in southeast Montana and northeast Wyoming about 120 miles east to west and 200 miles north to south known for its coal deposits. It is the single largest source of coal mined in the United States and contains one of the largest deposits of coal in the world. Most of the active coal mining in the Powder River Basin actually takes place in drainages of the Cheyenne River. Because of the Powder River Basin, Wyoming has been the top coal-producing state in the United States since 1988. In 2007, the Powder River Basin alone produced 436 million short tons (396 million tonnes) of coal, more than twice the production of second-place West Virginia, and more than the entire Appalachian region. Overall, the Powder River Basin accounts for about 37 percent of U.S. coal production. The Black Thunder Mine is the most productive coal mine in the United States; in 2006 this single mine produced 84 million metric tons of coal, more than any state except Wyoming, West Virginia, and Kentucky. The majority of the coal mined in the PRB is part of the Fort Union Formation. Because of its low sulfur and fly ash content, this coal is exported outside the region and supplies of the coal in the region makes it very desirable. Coal supplies about half of the United States electricity supplies, with the PRB mines supplying around 40% of the coal that fuels those stations, mainly to the east of the Rocky Mountains. Virtually all the coal mined in the Powder River Basin (431 million tons out of the 436 million tons mined in the entire basin in 2006) comes from the Gillette field. In 2008 the U.S. Geological Survey released a detailed assessment of the coal resource in the Gillette field. USGS concluded that the portion of the recoverable coal that can be mined, processed, and marketed at a profit, based on conditions in 2007, including $10.47 per ton and assuming an 8 percent rate of return, is 10.1 billion short tons for the six coal beds evaluated. This is about half the estimate arrived at by a 2002 study of the same field, which arrived at an economically recoverable resource of 23 billion short tons. However, if the price of coal is assumed to be $14.00 per ton, matching the sales price of coal for the Gillette coalfield as of March 2008, the reserve would be 18.5 billion short tons, assuming no increase from 2007 operating costs. If cost per ton rose to $60, the estimated reserve would rise to 77 billion short tons. Read more about the Powder River Basin at CoalSwarm. This article uses content from the CoalSwarm article “Powder River Basin” on the SourceWatch wiki. The material is provided under the terms of the GNU Free Documentation License 1.3. The Pace Coal Project was originally tested by Mobil Oil in 1979. At that time, 45 samples were taken, which showed that the coal was high volatility bituminous, a higher grade of coal than normal in the Powder River Basin. In April 2010, American Power Corp. acquired the land associated with the project. It is believed that the mine could hold 410 million tons of coal. The Buckskin Mine Hay Creek II proposed mine is an extension of the existing Buckskin Mine. In February 2010, Management Energy Inc., a California coal startup, amassed leases on more than 10 square miles of land to build new coal mines in south-central Montana, near Red Lodge, in partnership with Tennessee coal entrepreneur John Baugues Jr.. In March 2010 Arch Coal made a successful bid of $85.8 million for the right to mine about 8,300 acres of state-owned minerals in the Otter Creek Tracts in southeastern Montana. The company said the land is a strategic platform for future growth in the Northern Powder River Basin. The company controls about 1.5 billion tons of coal reserves in Montana’s Otter Creek area. The state of Montana Land Board has been looking to lease 616 million tons of coal reserves known as Otter Creek, which it received from the Federal Government at the beginning of the decade. The State Board of Land Commissioners made the initial decision on December 21, 2009. Montana Governor Brian Schweitzer, a proponent of coal development, sits on the board along with other Montana officials. Read more about the Otter Creek at CoalSwarm. This article uses content from the CoalSwarm article “Otter Creek” on the SourceWatch wiki. The material is provided under the terms of the GNU Free Documentation License 1.3. Proposed Otter Creek Coal Mine by EcoFlight. Photos were taken June 3, 2010. Black Thunder Coal Mine by EcoFlight. Photos were taken June 3, 2010. Powder River Basin by Carrie La Seur at Plains Justice. This is a series of aerial photos taken in October, 2008. Powder River Basin Coalmines by DocSearls. 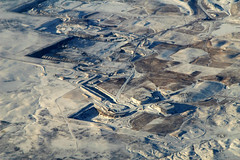 This is a series of aerial photos taken off of a flight from Boston to LAX on January 27, 2009. The Bureau of Land Management has announced a new coal lease sale in the Powder River. The South Hilight Field Coal Tract in Campbell County, Wyoming holds an estimated 223M short tons of mineable coal in two different seams, one 13 feet thick and a deeper one that is up to 75 feet thick. The tract is adjacent to the south and west of the Black Thunder Mine, and the lease sale was requested by the Ark Land Company, of St. Louis, MO. Bids for the lease sale are due by December 13, 2011, and the lease sale will be the next day. 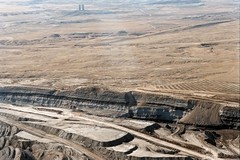 MSHA has posted the fatalgram for the fatality at Peabody Coal’s North Antelope Rochelle Mine. It briefly updates the state of the investigation into the death of Cody Brown, 29, a contractor from Spearfish, SD. COAL MINE FATALITY – On Thursday September 1, 2011, a 29-year-old contract driller with 1 year, 3 months of experience was killed at a surface coal mine. The victim was attempting to separate a pipe connection when he was struck by a tong wrench. The rig was being used to drill a water well. The crew was working to free the drill stem that was stuck in the drill hole when the accident occurred. Union Pacific publishes weekly shipping details for the mines that it services in the Powder River Basin and the Uinta Basin. Web page by the US Energy Information Administration summarizing energy consumption, production and prices for the state of Montana. Web page by the US Energy Information Administration summarizing energy consumption, production and prices for the state of Wyoming. Colstrip, Montana is a book by native Montanan photographer David T. Hanson that documents the effects of the Rosebud mine on the region around Colstrip from the 80s to the present. Featuring 81 color photographs wrapped by an introduction and conclusion, this book shows the mine from the ground, from the air, up close and from a distance. Northern Plains organizes Montana citizens to protect our water quality, family farms and ranches, and unique quality of life. The Union Pacific railroad has detailed statistics and information about mines in its service region in the southern Powder River Basin. Information includes mine histories, transport characteristics of the mine, and a detailed chemical analysis of the coal typical to the individual mine. The Union Pacific Railroad has a page comparing and cataloging the quality of the coal at all the mines in the United States that it services. UP services mines in Colorado, Southern Illinois, the Southern Powder River Basin, Southern Wyoming and Utah. For each of these mines UP reports the Btu/lb as well as the percentages of Sulphur, Ash, Moisture, Volatile Matter and Fixed Carbon. Ambre Energy Limited has finalized its purchase of Cloud Peak Energy’s interest in the Decker Mine located in the Powder River Basin. Ambre now holds 100% of the Decker Mine. As a condition of the sale, Ambre will assume all liabilities for the mine, including reclamation, and has replaced the outstanding bonds. Additionally, as part of this deal, Cloud Peak was granted an option to export 7 million metric tons through Ambre’s proposed Millenium Bulk Terminals. The U.S. Army Corps of Engineers has placed a hold on Ambre Energy Limited’s application to construct a barge loading terminal at the Port of Morrow in Oregon. Ambre proposed this facility to export coal mined in the Powder River Basin to asian markets to offset flagging domestic demand. The proposed terminal has faced harsh criticism in Oregon, where some see the coal exports as a threat to the Columbia river and the communities situated near it. 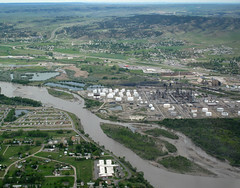 The Powder River Basin is expected to face severe rail congestion until at least late 2014 according to the U.S. Energy Information Administration. Despite the frigid winter and an increased demand for coal to restock pile utilities, the delays from winter weather have created a backlog of coal shipments. Additionally, a shorter harvest season and the boom in domestic oil production created the increased need for rail cars. All of these factors have cause severe delays in rail deliveries out of the Powder River Basin. Mines like Arch Coal are seeing this first hand such as at the Black Thunder mine where the company will be trying to fulfill their orders throughout the remainder of 2014. As Washington state governor Jay Inslee recently stated that he looks to wean Washington state utilities off of coal completely, China publicly released a plan last week to speed up their solar power development. This is in response to the devastating pollution caused as a result of coal consumption in China and the growing public pressure to switch to more clean burning power. In combination, these decisions could have a major long-term impact on the coal companies of the Powder River Basin whom rely heavily on coal exports to the Chinese market as well as utilities in the nearby Northwest. Union workers are facing dire prospects in maintaining their unions in the Powder River Basin coal-mines. Of the 16 coal-mines operating in the Powder River Basin, only 3 are still unionized. Additionally all 3 of these remaining unions primarily work on reclaiming mined land, rather than on high volume producing coal mines. This shrinking of unionization in the Powder River coal beds highlights the goal of the coal companies to keep the union out of the highest grossing and most productive mines. Washington state recently proposed to curb carbon pollution by eliminating imports of coal-fired power. Though coal only accounts for 13 percent of Washington’s electricity, coal accounts for almost 80 percent of the Washington utilities’ emissions of carbon dioxide. In response, U.S. Representative Steve Daines has directly addressed Washington governor Jay Inslee to override this proposal. Daines stated that limiting imports of coal would significantly harm Montana jobs and the economy of the entire state. Decker Coal Mine located 35 miles northeast of Sheridan, WY on the Montana/Wyoming border recently announced they would be rehiring 32 employees who were laid off last year. There were over 59 coal miners fired last year at the Decker Mine. These rehiring’s come at a time when first quarter profits are down throughout the Powder River Basin and impending curbs on coal plant emissions being discussed on a national level. At the close of the first quarter of 2014, the four largest coal companies working in the Powder River Basin of Wyoming all posted losses. The reasons being attributed for these losses are the bad weather and rail interruptions that have slowed down the shipments of coal out of Wyoming. Nevertheless, coal executives with Alpha Natural Resources, Arch Coal, Cloud Peak Energy and Peabody are all optimistic that next year will see significant improvement in contrast to the losses incurred during this first quarter of 2014. Chinese delegates recently visited the Cordero Rojo mine in Wyoming’s Powder River Basin as part of a three-day tour of Wyoming to increase U.S., Chinese relations. The visit highlights China’s demand for American coal and the massive growth of the energy sector in China. China is the biggest coal customer in the world and uses four times the amount of coal annually as the United States at over 4 billion tons of coal a year. The government affairs manager for Cloud Peak Energy, Jason Begger emphasized the biggest challenge in getting Wyoming coal into the hands of the Chinese is the challenges of exporting the coal out of the northwest. This article underlines the point that the supply of Wyoming coal is contributing to the vast economic growth of China’s industrialization. A new assessment of coal reserves in the Southwestern Powder River, a region currently unmined. A total of 23 coal beds are identified containing an estimated 341 billions short tons reserve mostly located at a depth of 1000-2000 feet and considered uneconomic to mine. Released September 16, 2011. Campbell County, Wyoming. US Dept of Interior, Bureau of Land Management. Rejects Lease By Application due to lack of consent by owner of surface rights. Original request made Feb 10, 2006. Rejection signed June 3, 2011.